With its impressive sound, built-in effects, and the ability to swap COSM amp types via a free app for iOS and Android devices, the CUBE-10GX is the perfect small amp for jamming, bedroom practice, and recording. Built to the respected CUBE standard, the CUBE-10GX delivers big, full tones with its custom 8-inch speaker and heavy-duty cabinet design. Clean, Crunch, and Lead amp types come ready to play from the factory, but you can easily switch them out from your favorite mobile device. The CUBE KIT app includes multiple amps to choose from, including vintage classics, ultra-heavy gain machines, and even amps for bass and acoustic-electric guitar. The compact CUBE-10GX also includes options for shaping your tones even further with three-band EQ and onboard chorus, delay, and reverb effects. Packing versatile amp sounds, simple-yet-powerful tone controls, and high-caliber effects, the CUBE-10GX is ideal for both beginning guitarists and experienced players looking for a great sounding small amp. 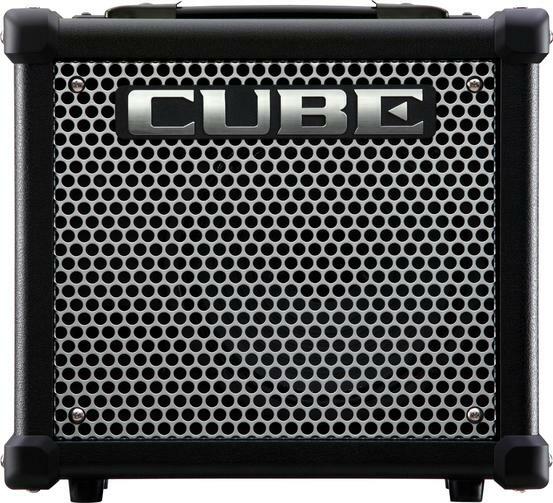 Renowned CUBE construction quality provides rich, full sound and maximum durability, with a custom-designed 8-inch speaker, ultra-rigid cabinetry, heavy-duty corner protectors, and more. From bedroom practice to jamming with friends to tracking in the studio, the CUBE-10GX delivers top-shelf guitar tones wherever you play. Out of the box, the CUBE-10GX comes ready to rock with Clean, Crunch, and Lead COSM amp types. But that’s just where the fun starts—using the CUBE KIT app for iOS and Android devices, you can load up those three slots with a variety of different amp types and adapt the sound of the CUBE-10GX for the music you like to play! Available as a free download, CUBE KIT includes seven additional COSM amp types to cover any style, from jazz to classic rock to high-gain metal. For enhanced versatility, there are even amp types designed for bass and acoustic-electric guitar. Simple and intuitive to use, CUBE KIT makes it easy to customize the CUBE-10GX’s sound in seconds. The CUBE-10GX is equipped with Bass, Middle, and Treble controls for fine-tuning your tone, plus three high-quality effects. Chorus, delay, or reverb can be dialed up easily with a single intuitive knob, and the reverb section offers plate and retro spring variations for a wide range of sound. Via the rear-panel Aux In jack, you can plug in a music player or smart phone and riff along with your favorite tunes. There’s also a Rec Out/Phones jack, which mutes the onboard speaker and provides a direct output complete with COSM speaker modeling. This is a great feature for quiet practice with headphones, and also for tracking the CUBE-10GX’s pro COSM tones directly into your favorite recording devices.